It can sometimes create problems while merging. Also, it is proprietory although there are open source version maintaining tools out there in the market such as Bazaar, GIT, etc. Overall a very good and robust tool for version maintaining. However, please consider other open source software such as Bazaar, GIT etc. On the paid side, SVN is also a good tool. It is a version control tool which helps manage the change of documents, programs, web sites, and other sorts of information. Basically, a logical way to organize and control revisions of files. What Version Control Systems solution do you use? 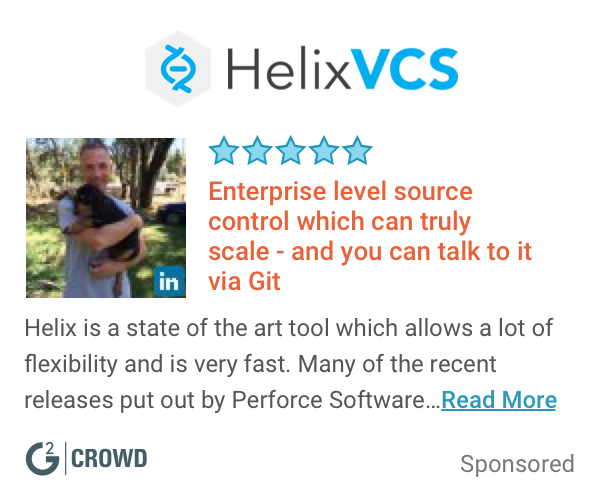 Helix Core is an industrial-strength version control and collaboration platform that supports flexible workflows. Helix Core eliminates the complexity of large-scale, distributed product development – allowing you to build products faster while protecting your valuable IP. * We monitor all SourceAnywhere reviews to prevent fraudulent reviews and keep review quality high. We do not post reviews by company employees or direct competitors. Validated reviews require the user to submit a screenshot of the product containing their user ID, in order to verify a user is an actual user of the product. Hi there! Are you looking to implement a solution like SourceAnywhere?